The book is presented as a Adobe Acrobat (PDF) file, requiring Adobe Acrobat Reader 5.0 or Adobe Reader 5.0 (or equivalent program from another vendor). The PDF file is page-for-page and word-for-word identical with the text of the printed book. The PDF file has security features activated that will prevent the user from printing out any of the pages, or from cutting and pasting text from the pages: it is intended for on-screen viewing only. The code examples are provided as an ASCII text file from which any or all of the code can be copied, cut, pasted, printed out, etc. The disk also includes a readme.html webpage that will allow you quick and easy access to the PDF, the code examples, Hazel's online docs, Netsville's other Hazel pages, and Hazelbook,com's home page and discussion board -- all from one webpage. Special Offer! Order either the full book in a three-ring binder, or the book pages only, and, if you order the CD-ROM version as well, you'll get it for half price. 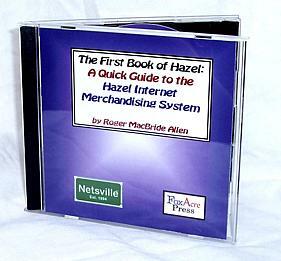 A sampler of the text of The First Book of Hazel CD-ROM can be viewed by clicking on this link.